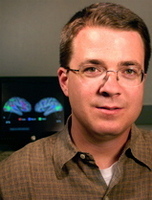 My research program bridges the fields of cognitive development, cognitive neuroscience, and social neuroscience and uses functional neuroimaging, visual scanpath recordings, and virtual reality techniques to address fundamental questions regarding the development and neural basis of social cognition in children with and without autism. Definitions of social cognition commonly link this construct to social behavior and encompass social perception (the initial stages of evaluating the intentions of others by analysis of gaze direction, facial expressions, gestures, body movement, and other types of biological motion), theory of mind (the ability to make inferences about the mental states of others), and attributional style (the way one tends to explain other people’s behavior). Studies in my laboratory are designed to probe the typical and atypical development of social cognition abilities. By studying the normal ontogeny of the brain mechanisms underlying social cognition and the abnormal development of these mechanisms in children with autism, I hope to uncover the building blocks for complex, multi-faceted, social cognitive abilities. Ornstein, P. A., Baker-Ward, L., Gordon, B. N., Pelphrey, K. A., Tyler, C. S., & Gramzow, E (2006). The influence of prior knowledge and repeated questioning on children's long-term retention of the details of a pediatric examination. Developmental Psychology, 42(2), 332-344. Pelphrey, KA, Morris, JP, Michelich, CR, Allison, T, & McCarthy, G (2005). Functional anatomy of biological motion perception in posterior temporal cortex: An fMRI study of eye, mouth, and hand movements.. Cerebral Cortex, 15(12), 1866-1876. Pelphrey, KA, Morris, JP, & McCarthy, G (2005). Neural basis of eye-gaze processing deficits in autism. Brain, 128(5), 1038-1048. Mosconi, MW, Mack, PB, McCarthy, G, & Pelphrey, KA (2005). Taking an “intentional stance” on eye-gaze shifts: A functional neuroimaging study of social perception in children. NeuroImage, 27, 247-252. Pelphrey, KA, Reznick, JS, Goldman, BD, Sasson, N, Morrow, J, Donahoe, A, & Hogdson, K (2004). Development of visuospatial short-term memory in the second half of the 1st year. Developmental Psychology, 40(5), 836-851. Pelphrey KA, Morris JP, McCarthy G (2004). Grasping the intentions of others: the perceived intentionality of an action influences activity in the superior temporal sulcus during social perception. Journal of Cognitive Neuroscience, 16(10), 1706-1716. Pelphrey K, Adolphs R, Morris JP (2004). Neuroanatomical substrates of social cognition dysfunction in autism. Mental Retardation and Developmental Disabilities Research Reviews, 10(4), 259-271. Pelphrey, KA, Viola, RJ, & McCarthy, G (2004). When strangers pass: Processing of mutual and averted gaze in the superior temporal sulcus. Psychological Science, 15, 598-603. Pelphrey KA, Singerman JD, Allison T, McCarthy G (2003). Brain activation evoked by perception of gaze shifts: the influence of context. Neuropsychologia, 41(2), 156-170. Pelphrey KA, Mitchell TV, McKeown MJ, Goldstein J, Allison T, McCarthy G (2003). Brain activity evoked by the perception of human walking: controlling for meaningful coherent motion. Journal of Neuroscience, 30(23), 6819-6825. Pelphrey KA, Mack PB, Song A, Guzeldere G, McCarthy G (2003). Faces evoke spatially differentiated patterns of BOLD activation and deactivation. NeuroReport, 23(14), 955-959. Wright, TM, Pelphrey, KA, Allison, T, McKeown, MJ, McCarthy, G (2003). Polysensory interactions along lateral temporal regions evoked by audiovisual speech. Cerebral Cortex, 13(10), 1034-1043. Pelphrey, KA, & Reznick, JS (2003). Working memory in infancy. Advances in Child Development and Behavior, 31, 173-227. Cody H, Pelphrey K, Piven J (2002). Structural and functional magnetic resonance imaging of autism. International Journal of Developmental Neuroscience, 20(3-5), 421-438. Pelphrey KA, Sasson NJ, Reznick JS, Paul G, Goldman BD, Piven J (2002). Visual scanning of faces in autism. Journal of Autism and Developmental Disorders, 32(4), 249-261.